Here in the Netherlands we've Provincial elections coming up on the 2nd of March. I guess we're not eligible to vote, as we haven't received voting forms this time around. 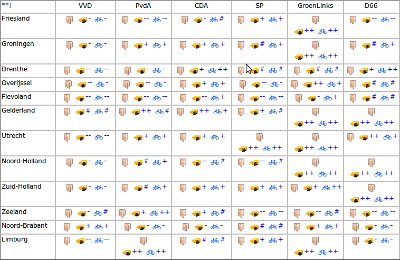 Intercityfietser has put together guidance on who to vote for depending on how positive different parties, in different regions are about cycling in general, and also on providing for longer distance cycling. CDA: Drenthe is the number 1 cycling province, but also with the largest multi-day cycling event (the fietsvierdaagse) in the Netherlands. Must make sure that the area has the best quality cycle paths of the Netherlands reaching all tourist sites and attractions. Development and construction of a dense network of hiking, biking and horse trails. Combating traffic congestion and helping the environment by promoting cycling in Drenthe with a focus on commuters. Working with the municipalities to improve the cycle network to get riders from A to B in a safe and comfortable manner. Organising an award for the best municipality with regards to cycling. Pooling expertise or various partners in cycling. D66: Encourage people to go out in their free time by providing nature areas, cycle routes and subsidies for cultural events. Aiming at strengthening the green character of the area, of increasing sustainability, and creating attractive living and working areas. Good public transport and good and safe roads and cycle paths. Support for further separation of cyclists and pedestrians (vulnerable road users) from motor vehicles. More cycle paths, not only for recreation but also for riding to work and school. Getting users together with the planners to ensure good standards. A network of electric bike charging points on good quality cycle paths. Increase in interoperability between cycling and other modes, with for instance, covered cycle parks at carpools. In favour of organizing activities which don't have a negative effect on people or the environment, the endless cycling and walking paths in Drenthe offer ample opportunity for "clean" recreation. On the other hand, of those who replied, the PvdA locally gets a bit of a negative remark because their response is merely that they want to maintain Drenthe as the number one cycling province and make it easier to get stolen bikes back. That's not enough. The VVD gets the lowest mark, with the writer seeming to think that they view the car as the main form of transport in a sparsely populated region like this. None have anything actually negative to say, of course, as that would be political suicide. I feel confident that whoever gets into power locally, progress will continue. In any case, proportional representation is the norm so power will be shared, and those political parties who are represented will have to discuss and make sensible decisions between them. I found the voting information through, and "borrowed" the illustration at the top from, ligfiets.net. Ask the gemeente about this, I think you are allowed to vote, but I'm not sure. www.rijksoverheid.nl says: "Voor de Provinciale Staten mogen alle Nederlanders stemmen die 18 jaar en ouder zijn en die in de betreffende provincie wonen." So no, you are not allowed to vote. You would be for gemeente, waterschap and Tweede Kamer, but we are keeping Provinciale Staten, and by implication, the Eerste Kamer, to ourselves :-). Non-citizens aren't allowed to vote in the provincial elections as the provincial councils elect the upper house of parliament, and electing the upper and lower houses of parliament is done by Dutch nationals only. You can only vote in the local elections, and in the EU ones (where you get a choice of your home state and your state of residence). You can only vote for these elections when you are of Dutch nationality. Non-Dutch may only vote for the local council and then only when you are a permanent resident. Which you are, so that is why you can vote for the Assen council. So weird, my girlfriend moved here from the US in may 2010, got a residence permit for one year, but last week she did receive her voting card for the provincial elections.